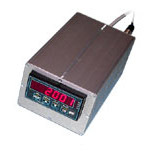 The D2000D Desktop Digital Pressure Gage is designed as a stand- alone pressure measuring system, with excellent performance characteristics. The Display is all solid state with 5-Digit, red LED characters, 0.7 inches high, with polarity indication., housed in an aluminum enclosure. The sensor is an all stainless steel machined, one piece body This approach eliminates any leaks . The D2000D is offered standard with 95-265 vac 50/60 hZ input power. Pressure ranges of up to 15,000 psig are available. Standard pressure port is 1/4" -18 NPT male. Accuracy of the D 2000 D is 0.1% F.S. Peak Hold feature is standard, operated by front panel pushbuttons. D.C. power, 11-30 vdc, is optional, on special order. RS 232 or RS485 digital output-optional. Analog outputs of 4-20mA or 0-10 volts, are also available as plug in options. Transducer has 24" of 4 conductor shielded cable with connector..